The colony of stray cats that live in the back lane have had kittens. Here's one cutie making herself at home in the empty water bowl on our back door step. We have about 13 strays at the back and until now I haven't been able to do much more than keep them fed and dewormed. I can't afford to have the whole lot injected and spayed. Nor do I have the cages needed to transport them to the vet, or the space to keep the girls for 5 days while they heal. When we first moved in I called various animal shelters to ask if they would help but none were interested. Now I have some hope. First, I have a friend with cages who has some space to store the kitties while they recover. Second, another friend is checking out some subsidized operation and inoculation services. 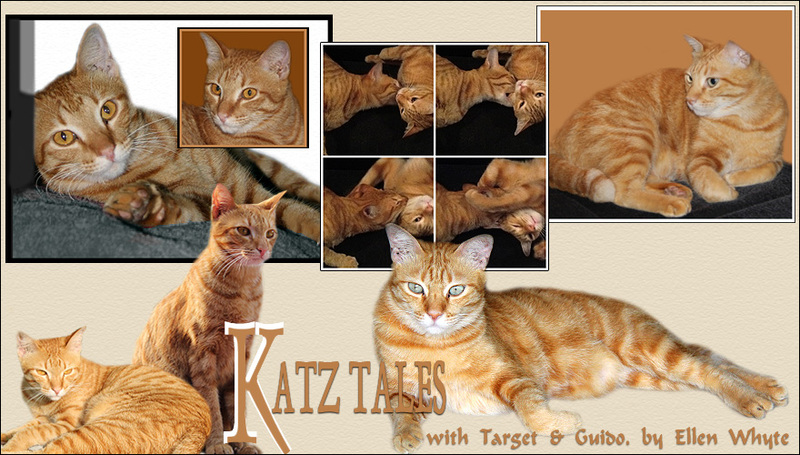 And finally, when Katz Tales sells, I should have some extra money in hand. But as royalties are paid a year after publication, this project will have to wait. In the meantime I've started spaying the street cats who live in the front of our house. Our friend Tam is now inoculated and will be going for his snip in a month's time. His mum and sister Snow are next. I couldn't do them all at once because mum and Snow have had kittens. But in 3 weeks those kittens will be OK and I can do their older female relatives. And then will have to scrape together money to do those 4 kittens. It's never ending! I wish people would spay their cats and stop dumping their cats! For more Cats on Tuesday visit Gattina or check the sidebar for the COT menu. That kitten certainly is a cutie! With all those stray kittens, it does make you wonder why people don't spay and neuter their cats. Thank you for helping the kittens by taking care of them and doing what you can to stop more and more kittens from being born. The world is a better place because of people like you! I am glad those kits have someone like you to give them help. Ours is not stray, but how could some senseless people let their pets go. I'm just happy that there are a lot of wonderful people like you. Yet we have some limitations. Good luck with Katz Tales. Hi Katz, I just joined Cats on Tuesday. And I hope to learn more about "cat parenting". Thank you for leading me to this site. Its sad to see strays everywhere and the little kitties hungry and homeless. And it started with one cat, dumped by the owner! Great things you're doing. Maybe you and your friends can set up a small association to help these cats get spayed and neutered and set up a donation table for this purpose. Just an idea. Or something along that line. My cousin is doing what you're doing in a smaller scale. She has adopted six cats in her house, and spay and neuter the strays behind her house every now and then. That's a real tragedy. We have young vets (students) they help to neutre stray cats for free. Maybe there are some around your place who would help. It's a good excercise for them too. I don't understand the ignorance of people who don't spay and neuter. She is so pretty. Yes, people need to become responsible! It is not fair to all of these innocent animals! i agree that some people just don't care about spaying cats. Some say it's cruel but I say that it is a must rather than seeing kittens die of accidents and other mishaps. I say thank you as well, you are doing a wonderful job with those kitties! Loved the post with the cats on the car...when I was young we had a cat who loved sleeping on top of our car. One morning we were on the way to school and heard a meowing...sure enough Samantha was on top of the car! I don't know how she managed to hang on so long but I'm sure glad she did lol. I agree with you about kitties and photo shoots...it is hard! But when you get a good shot it is worth it. Happy Tuesday! Thank you so much for helping these cats! It makes me feel so much better to know that people like you care about them. I'm wishing you all the best in finding help in your efforts - I know it must seem overwhelming at times. That is an adorable little kitten. I know what you mean about the strays. We took in one and one of our neighbors has taken in one, but if more people would spay and neuter their cats, this wouldn't happen. Thanks for taking care of the little cats in your neck of the woods. What a cute little kitten. Great work to get all the cats that you can spayed. Our mom did all of us and some others too - but we had a vet that worked with us and did not charge very much at all. Our local humane shelter was no help. Just ask around - some vet will be willing to help out! You have such a good heart and Im so glad to see you take care the kitties so well.You are a blessed person! What a cute kitten! The poor kitty's. We hope there is someone there who can help neuter and spay them! I will help! We'll get them under Project Second Chance/Mission Help, if you will help by catching them for me! We can do at least 2 a month! Let me discuss this with the vets on Sat, and call up Klinik Kembiri (Dr. Goh is a much better vet). Call me soon? I would like to start as soon as my kittens have been vaccinated and adopted. I have a big cage, 2 small cages and 2 clean litter trays to spare. By the way, the kitten looks just like Rafferty. Raff's eye infection has cleared up and he looks just like Bright-Eyes there! Covert: I would like to do the whole lot at once, because more than half of them are pure black and can't be told apart! I'm checking out some alternatives: let's meet up and talk in a fortnight??? Oh my, this is really never ending. or not quite. You make a huge difference for the spayed cats, increasing their quality of life ginormously, not to mention their life expectation. Do you know the Itty Bitty Kitty comitee(http://www.theittybittykittycommittee.com/)? They are doing a money raising thing for some weeks now and have gotten together quite a bit. We're sure that our mom would give some for your spay project (not much, she's a student, but a little) and surely others would do the same. We don't know how this firstgiving thing works but maybe that's a direction to inquire. We would be delighted to help and would definitely spread the word around.